Chain O' Lakes Park is another classic facility that the whole family will love, although it is a tought ticket to get. I have always ordered my seats early, but I am always stuck in the outfield bleachers where it can get particularly hot. Although the reserved seats are very close to the action and have lots of shade, the bleachers do have their benefits too. 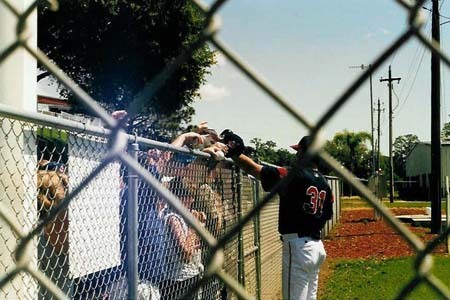 I sat right above the visitors' bullpen where fans could get the infamous John Rocker's autograph throughout the duration of the game, and there was a lively, singing beer vendor roaming the area. The staff, particularly those in the bleachers, are very friendly and helpful. Whether sitting in the bleachers or reserved section, all of the seats have a great view. This park serves up the best 100% Lemonade in the Grapefruit League. Right behind the bleachers is a large food court area with a delicious grill that is usually worked by youth organizations. I also highly reccomend the pretzels, which are one of the Chain O' Lakes specialties. My favorite part of Chain o' Lakes is the access fans have to the players. Around the park are several practice facilities including about five other fields for players to practice on. 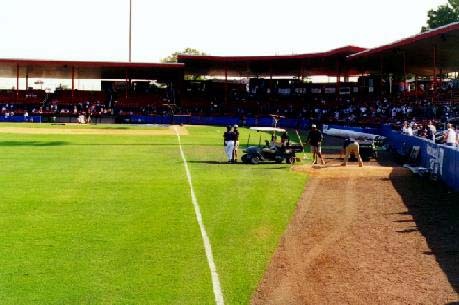 There are always lots of minor leaguers hitting around here, so the BP fields are great for catching baseballs and gettting some up and coming prospects' autographs. Players run through the same paths that fans use to move around the facility. Before a game I attended, I explored the park area surrounding the stadium, and there was a group of four players just practicing bunting in a small grassy area that had no fences or ropes to hold fans back. If a player fouled a ball back, one of the five or six fans wathcing would just pick it up and hand it to them. In this era of mega contracts and super-star players, it is an actual shock to see something like this...but that's what Spring Training is all about! Another great amenity of Chain O' Lakes park is Hall of Fame pitcher Bob Feller. Bob is almost always at the park where he signs autographs, in uniform, near the food court. He charges $5, which goes towards his museum, for 8x10's, and anything else is free. The man is a real class act. This is one of my all-time favorite places to see a ball game. A look from the hot, outfield bleachers of Chain o' Lakes Park. Not too bad a view, but the heat is simply unberable. This gives you an idea of how close you can get to the player here. At this particular session, a small toddler kept picking up the balls that were bunted fowl and handed them back to the players. 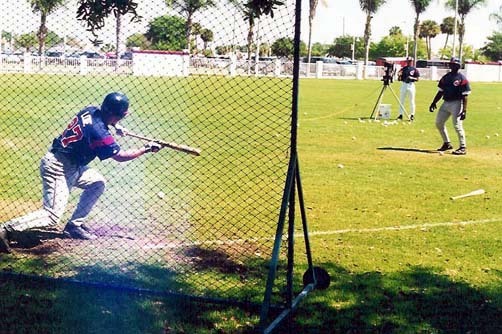 Spring training at its best. 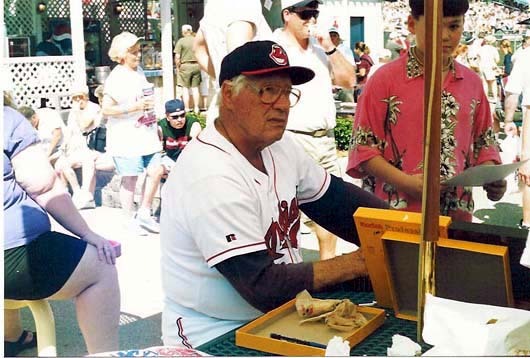 Indians Hall of Fame pitcher Bob Feller is usually on hand at either the food court or the front of the stadium to sign autographs- sometimes for free, sometimes for a small price. You don't want to miss this opportunit to meet a great ball player and an extremely friendly man. Chuck Finley signs autographs for some fans near the team's weight training facility. Autograph tip: there are so many great places to get autographs here. A good place to get autographs is right behind homeplate at the very end of the dugout. If you can't get here, move on. Try going to the left field wall at the bleachers and get the visitors as they enter the stadium. There is an extensive practice facility that is accesible to fans so find practice fields and the weight training area to get autographs. Be sure to get Bob Feller's autograph at the food court located on the third base side of the stadium. Finally, in the food court area, there is a fence with a black screen. Behind this fence is the visiting team bus. You can just see the players' heads, but this is a great place to get autographs. This stadium is a hotbed for signatures.